Fabio Celi & Gli Infermieri were a group founded by Fabio Celi (real name Antonio Cavallaro) in San Giorgio A Cremano (near Neaples) towards the end of the 60's, with the name of Fabio Celi & I Pop. The line-up included Ciro Ciscognetti, Luigi Coppa , Rino Fiorentino and Roberto Ciscognetti. With this name they realized a POP single. 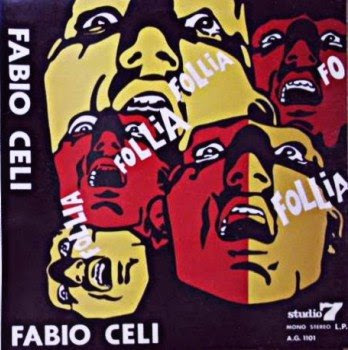 Their only album (Follia) was recorded at the 'Studio 7' and was supposedly published in 1969 under the name of Fabio Celi & Gli Infermieri. This album is very Rock. It is described as psychedelic as a result of the use of a Farfisa organ modified to sound like the Moog. The lyrics are heavy, often obscure, and against certain aspects of society. Due to this the album was censored by RAI (the Italian broadcasting) and the promotion was really poor. In truth this album is also a post Beat album. Celi released a single in 1971 with the same musicians of the album except with Silvio Feo instead of Coppa. In 1973 Fabio Celi participated in the 'Festival D'Avanguardia E Nuove Tendenze' in Neaples (famous festival for RPI birth and promotion) and in 1975 in 'Adesso Musica', a TV show. The song 'Uomo Cosa Fai' led to the reprint the album but without producing any significant sales. The band were never able to successfully return. Only the drummer Roberto Ciscognetti remains in the music business. In my opinion Fabio Celi & Gli Infermieri' can be juxtaposed with The Doors, Iron Butterfly, Vanilla Fudge, Deep purple, Colosseum, Warhorse, Biglietto Per L'Inferno and in general to all groups on the Rock side of Early Prog. If the 1969 release date claimed by Celi was accurate then this is one of the earliest transitional albums moving from Pop and Beat to the classic RPI period we would know a few years later. Why this artist is listed in www.progarchives.com: Fabio Celi & Gli Infermieri was one of the first RPI bands with Le Orme, Dik Dik, Formula 3 and others.